Creativity has no boundaries, geographic or otherwise, which is what the 15 international artists of The Line Art Challenge, set out to prove when they embarked on an artistic feat to each produce 100 sketches in 100 days. Based in 11 different countries, the artists used modern communication methods to share their work and motivate and inspire each other across continents to reach their collective goal of 1,000 traditional sketches. While the final drawing tally was 850, the resulting artwork from this challenge is remarkable in its diversity and complexity: fantastic warriors, menacing space beasts, Gigeresque villains, and whimsical everyday heroes are among the characters you ll meet in this unique collection." 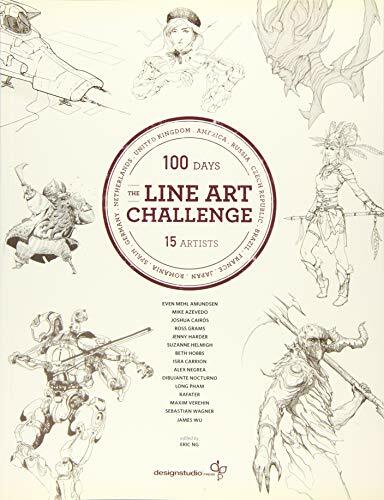 The Line Art Challenge artists, known as the book club, are Even Mehl Amundsen, Mike Azevedo, Joshua Cairos, Isra Carrion, Ross Grams, Suzanne Helmigh, Jenny Harder, Beth Hobbs, Alex Negrea, Dibujante Nocturno, Long Pham, Rafater, Max Verehin, Sebastian Wagner, and James Wu. In their professional careers they have worked for such prominent companies such as Games Workshops, Lionsgate, Studio Gobo, Warner Bros., and Wizards of the Coast.